Evoke the charm of the Victorian era in your garden with the Home Bazaar Victorian Cottage Bird House. This decorative home features a cozy porch, complete fencing along it for added detail. Five arched windows each have white shutters and a sill for a realistic touch, and the center door has the same rounded shape. The 1.125" diameter opening rests under a shingled roof, to protect the avian residents. A piece of screen glued to the interior of the house acts as a ladder, allowing fledglings to reach the entrance hole. Horizontal slits under the roof help keep the house cool, and two drainage holes on the base keep the nest dry. An easily removable panel on the back of the item makes cleaning the home simple, and the house can be mounted to a tree or post with the attached mounting peg. The pale color adds a gentle feel to the unit, and the wooden shingles create even more detail. 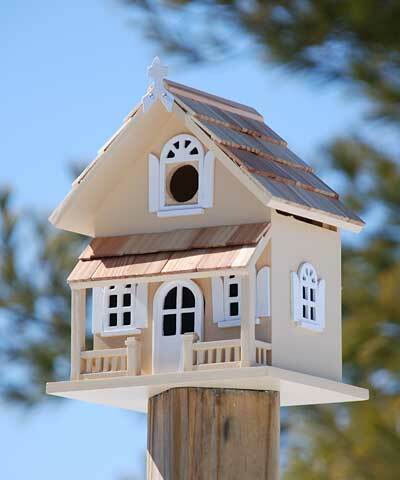 Invite birds to roost properly in your yard in this Victorian Cottage Bird House.